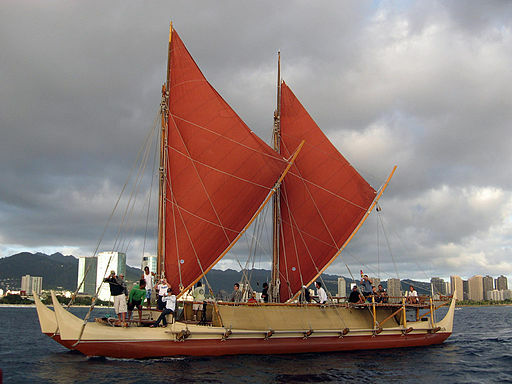 In his book ISLAND WORLD: A History of Hawaii and the United States, Gary Y. Okihiro talked to master navigator Mau Piailug, the man who taught the Hawaiians how to navigate the Hokule’a, the Hawaiian sailing canoe in the manner of their ancestors. Piailug talked about having a star compass in his head with Polaris pointing north and the Southern Cross south. The navigator paid attention to the rising of certain stars (which indicated east) and others setting (which showed west). Locating the canoe’s position on the open sea depended on his estimates of the canoe’s speed and direction. The interesting thing was that Piailug plotted his progress in relation to a “reference island” which sat well out of sight over the horizon and to familiar stars whose rising and setting indicated direction. The navigator’s goal was to keep his canoe stationary as the imaginary island moved from the bearing of one horizon star to another until the island had moved past all the horizon stars. Once the island had passed all of those stars, the journey was completed. The navigator’s mental plotting system let him break the voyage into manageable segments which were marked by the movement of the imaginary island from one horizon star to the next. This let him calculate his position. For me, that sounds like the most beautiful metaphor for how to move towards a goal that I’ve ever run across. You aim yourself, knowing that the goal is already out there, already moving towards you. All you have to do is make sure you’re positioned just right, in its path. It’ll come if you can hold steady, without manipulations and extraneous movements that take you out of its path. I’ve always had problems when I chase after a “goal” or desired outcome I’ve set. It’s like chasing butterflies if you do it the way everybody expert keeps telling you. You zig, you zag, you run yourself ragged, and the durned thing flitters all over the landscape, making no sense whatsoever. Ho’okele mindset, the mindset of the navigator, feels better to me. You just sit in your canoe and hold ‘er steady, doing all the stuff you need to do to keep yourself right-side-up and moving into the right position for the goal to intersect with your path. Deal with whatever comes at me. Back to my own True North. I TRUST IN THE POWER OF INNER TRUTH. I know the Creative dwells in me. It whispers even when I am not listening. I TRUST THE PEOPLE WHO LOVE ME. I dance and twirl around so much. And I can go wandering off to see what is there. And I really feel it takes joy in my playing.